One of the fun parts of The Walking Dead is seeing what gross new ways the show has dreamed up to dispatch of walkers, the decaying zombies perpetually hunting the series’ characters. Additionally, the practical effects emphasize just how disgusting and decayed these undead beings are, bringing an extra icky element to the show. 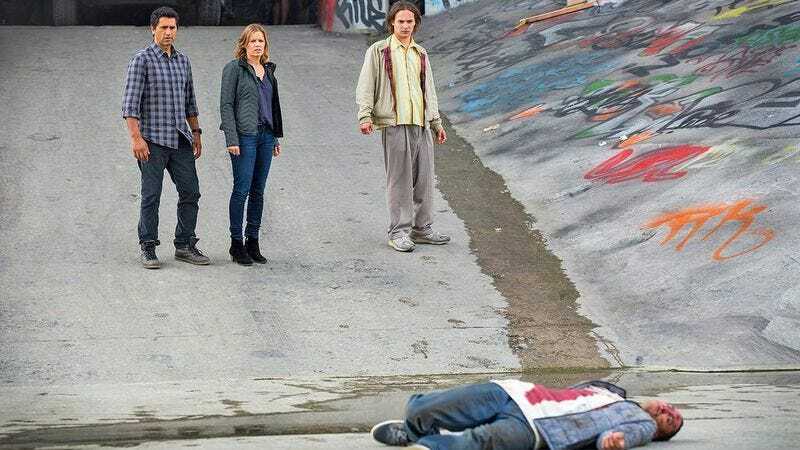 So, naturally, when it came time to make the spinoff show Fear The Walking Dead, creator Robert Kirkman decided that what America really needs is to see much more human-looking zombies. Because watching someone plant an ax in what looks like a normal child’s head is definitely going to up the “fun” factor. In a new interview with IGN, Kirkman talked about some of the things that will make the series stand apart from its progenitor, and near the top of the list is less stomach-churning zombies. They’re not going to be as decayed, and they’re not going to be as monstrous, which is going to make the violence in the show and the different things that happen that much more startling. Because we’re going to be dealing with a much more human walker. Left unsaid is just how human these walkers will be. Perhaps most of the fights will start because walkers in Los Angeles refuse to curb their dogs? Or maybe some human-on-zombie violence can ensure after a walker uses the carpool lane on the freeway without anyone in the passenger seat. Surely, getting reservations at their favorite restaurants will be a leading cause of the kill scenes on Fear The Walking Dead. Kirkman also talked about how the show will go back to the beginning of the outbreak, something the original series skipped over. “I think having Rick wake up from his coma was certainly a fun dynamic and a great way to open the original show, but actually watching civilization crumble around these people and getting to experience them learning how to adapt in a much faster way, and with much more danger and much more uncertainty, is going to make this show very different.” Indeed, watching people preparing for the apocalypse will make the show very different, in that it will make it more like Doomsday Preppers.